The 1950’s were called the Nifty Fifties. I remember the excitement of the 1950’s…the beginning of rock and roll, the flashy cars, the space race between the USA and Russia, the scare of being attacked by Russia, and the dawning of so many new things in technology. The “back room” as we called it was a large bedroom for all of us boys including George, Jerry, and me at first. Later Glenn, but George had moved off by then. Sometimes at night, we would turn the lights off and watch the dancing glow of the tubes in the back of the old radio and pretend that it was a television. At that time, in 1954 when I was four years old, we knew of one or two nearby neighbors who had televisions, but we had never actually watched more than a minute or two of a show. That old radio though served as great entertainment, and to this day I can smell the hot tubes and feel the warm bakelite plastic as it heated up while playing. Finally in 1955, Daddy went to Sears and Roebuck (He called it Sears and Rareback) and bought our first television. He put it on the Sears revolving account but couldn’t afford a TV antenna. So our first antenna was the spokes of a bicycle wheel attached to the side of our chimney. I think at the time I really thought it looked like a TV antenna and hoped everybody in the neighborhood could see it. 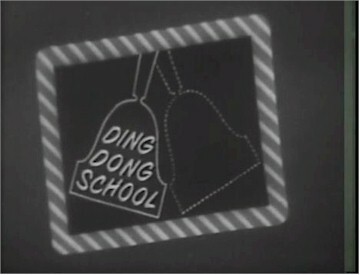 My strongest memories of that early black and white set are the Valleydale Sausage Co. pigs parading and singing “Hurray for Valleydale!” My favorite show was “Ding Dong School” with Miss Frances. It was the early “Romper Room” or “Sesame Street” but not nearly as colorful or high-tech. Just a plainly dressed woman and a few plainly dressed white children doing some exercises in early reading and math, and some artsy things, …but to me it was a whole new world. The 1950’s and early 60’s were scary times though in many ways. As a little boy, I had two big fears. One was being attacked by Russia and and the other was being visited by alien spaceships. Both of those fears were real fears for many back then. Rumors continued to fly about people spotting UFO’s and that the government was covering up actual UFO landings. I remember one night when I was alone in the back room all night. George was out of the house for a few months again, and Jerry must have been spending the night with a friend. But late that night I couldn’t go to sleep because I felt that the air was heavy with the presence of aliens. Suddenly a red glow, a flickering red glow filled the front yard outside my bedroom. The flickering and flashing glow became more intense as the night went on. I sweated profusely as the light reflected off my bedroom window and onto my bed. As hot as it was, I finally, after about two hours of horrifying fear, decided to close my window to keep the aliens out. I surely knew the light was a landing light from a spaceship. I moved carefully, ready to quickly close the heavy wooden window. But I had to take a peek…and as I did, I saw it… a new neon light flashing at the restaurant next to Dan Hunt’s gas station on the 291 Bypass, about 200 yards from my window. I guess the second fear wasn’t just on the minds of children, but on the minds of everyone as the war of words between the U.S.and Russia turned into a war of weapon building and threats. They called it a “Cold War”…and indeed it sent chills right through me. And then suddenly, we learned that Russia had moved missiles to Cuba and had them pointed at the U.S … At all of us. We took the threat and the fear very personally. Every time a plane would fly over, adults and children alike would look up afraid that it may be the enemy. Many people built, or bought bomb shelters. The Civil Defense put out brochures on how to stock and prepare a bomb shelter and suddenly everyone knew where the nearest public shelter was, at a school or public building. Our bomb shelter was set up in the corner of our dirt basement. We had a full basement, but it was there as a utility area only to house the coal furnace and coal storage. In the corner of this basement, Mother put canned goods, jugs of water, matches, candles, crackers, and first-aid items,… pretty much set up as neatly as the Civil Defense brochure had shown. Thank goodness we never had to use it because of an attack from Russia. No,we never had to use the shelter to hide from aliens or from the Russian bombs… But I do remember enjoying some saltines and lighting a candle down there one evening during a thunderstorm.